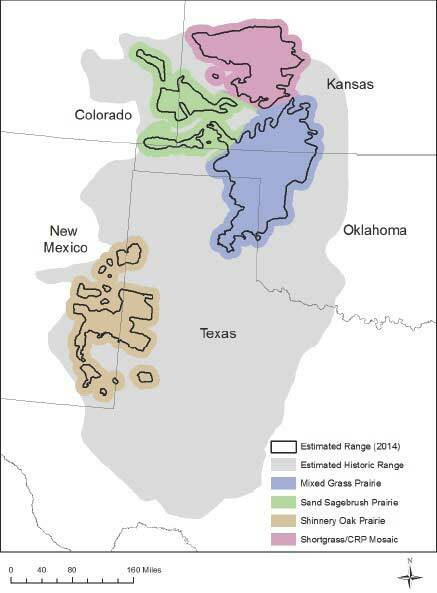 In March 2014, I wrote about the development of the Western Association of Fish and Wildlife Agencies’ (WAFWA) Range-wide Plan for conserving the lesser prairie-chicken, then considered a candidate for Endangered Species Act (ESA) protection. By May, the species had been listed as threatened under the ESA. This week, I spoke with Ross Melinchuk, Deputy Executive Director of Natural Resources for the Texas Parks and Wildlife Department and chairman of WAFWA’s Lesser Prairie-Chicken Initiative Council, to discuss the Range-wide Plan’s status, now slightly more than a year after this iconic member of the grouse family was listed. The plan hinges on the latter, participation from industry that funds mitigation projects and incentives for landowners to conserve lesser prairie-chicken habitat. To date, 181 companies (energy, electric, oi & gas) have enrolled about 11 million acres in the RWP. These companies pay an enrollment fee to participate in the plan, and “have to modify some of their practices for the benefit of the lesser prairie-chicken, and avoid certain areas,” says Melinchuk. If they choose not to avoid areas with lesser prairie-chicken habitat, they have to pay additional impact fees, which are scaled based on habitat quality. During this first year of the plan, WAWFA has collected just over $42 million dollars in enrollment and impact fees, 87.5 percent of which goes to fund off-site mitigation projects. Additionally, WAFWA authorized 1,169 project agreements with enrolled companies designed to minimize impacts to lesser prairie-chicken habitat where avoidance was not possible. Approximately 70% of those projects are located in lower priority habitats (Crucial Habitat Assessment Tool (CHAT) categories 3 &4), demonstrating a quantifiable shift away from higher priority CHAT 1 and 2 habitats. Landowners too have been integral to the plan’s success. WAFWA has finalized ten incentive-based conservation agreements with landowners to protect and conserve lesser prairie-chicken habitat on approximately 96,000 acres over the next ten years. Of those acres, 8,349 acres are scheduled to be restored to lesser prairie-chicken habitat this reporting period. According to WAFWA, “the anticipated total payout to landowners for these ten contracts is $14,741,200 over the 10-year period.” That payout is derived from the funds contributed by industry through enrollment and impact fees. With that acquisition, 10 percent of the plan’s conserved habitat is permanently protected, a goal set by WAFWA and the U.S. Fish and Wildlife Service earlier this year. That’s an impressive list of conservation actions, but has it all worked? Conveniently, WAFWA today released the results of this year’s range-wide aerial population survey. While results differed by region, the survey estimates the range-wide lesser prairie-chicken population at 29,000 birds, a 25 percent increase over last year. Good blog Amos. An important success of the LPC Range-Wide Plan is that industry has been able to continue their operations with some certainty within the LPC habitat range - even after the listing decision. Going forward, it will be important that the state regulatory agencies require participation in the RWP as a prerequisite of the permitting process. Without such a requirement, the companies trying to do right by the LPC will be penalized by competitors that are ignoring LPC needs.